For more than 50 years the brandname KAMEI has stood for innovative auto accessories of the highest standards in design and quality. The KAMEI success story began in earnest in Geneva in 1952 when the company founder, Karl Meier, presented an elaborately styled Volkswagen Beetle with a spectacular "horizontal stabilizer", the first spoiler in car history. 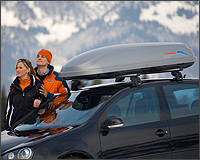 Since then KAMEI has been a leading manufacturer of stylish and highly-functional roof box systems, innovative car styling products and practical accessories for driving comfort. KAMEI's range of accessories are designed with comfort, function and elegance in mind, bringing fun and individuality to your car. KAMEI works in close co-operation with the car industry to ensure the compatibility of its products. All KAMEI products are designed and engineered to exacting standards that surpass internationally recognised TUV guidelines. KAMEI accessories offer stylish and functional ways to personalise your car, and help it stand out from the crowd. KAMEI makes the best quality and best engineered boxes on the market; they never go wrong, and they keep on looking good well beyond their 6 year guarantee period. Major breakthroughs in box design include KAMEI's "pull to shut" central locking system and the new DuoLift dual side opening system. 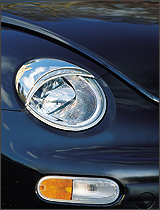 Discreet and classic, headlight trims give the car an elegant appearance. 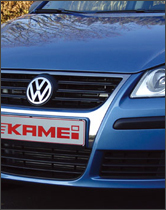 Easy fitting and car wash resistant, all Kamei headlight trims are made from ABS plastic. They are delivered in pairs or sets, black and unpainted (except for Beetle 44027 shown above). 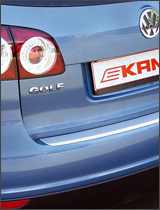 Give your Volkswagen the upmarket luxury or GTi look with KAMEI's Front Masks. A chrome or black effect for the grille and bumper. 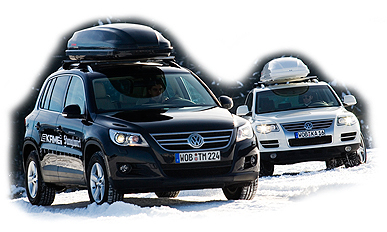 Available for VW's Fox to Touareg. KAMEI's Door Handle grip covers accentuate the side view of your car. Easy to assemble, self-adhesive. KAMEI's Load Sill Protectors offer visual effect and protection when loading or unloading your car. Easy self-adhesive assembly. 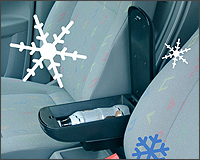 KAMEI's Armrests create a more comfortable and relaxed driving environment. The armrest has a flexible tilting function and can also be adjusted lengthways when required. It folds upwards out of the way when not in use. The top consists of high quality material, and snaps open and closed. The integral storage box can be used to keep small items or rubbish during your journey. 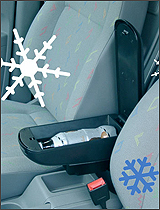 Easily mounted by attaching to a seat rail, without drilling.NEW Armrests with coolers now available. KAMEI's range includes some non-vehicle specific items like the Flower vase, car can holder, car coat hangers, bumper protection and more. The KAMEI Sunnyboy offers ideal protection against heat and harmful rays, providing pleasant shade from the sun. Its black appearance is subtle and stylish, and it can be used with the window open. It's effortless to fit or take down. Simply clip it on and away you go. KAMEI's extensive range of sports grilles can effectively enhance the sporty character of your vehicle. The range extends from honeycomb to screen sport grilles for Audi, Volkswagen and Vauxhall models. To fit KAMEI grilles you simply remove your existing grille and clip or screw your new grille in its place. They come complete with the KAMEI badge. KAMEI's Rallye Style effect roof Air Scoop Coversare designed to give your car the look of a touring car or world rally car. 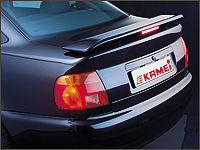 KAMEI's spoilers greatly enhance the aerodynamic features of your car. The rear window screen spoilers, sit at the top of the screen and by their special shape, give your car the look of a coupe. Rear wing spoilers are available for a large number of saloons.